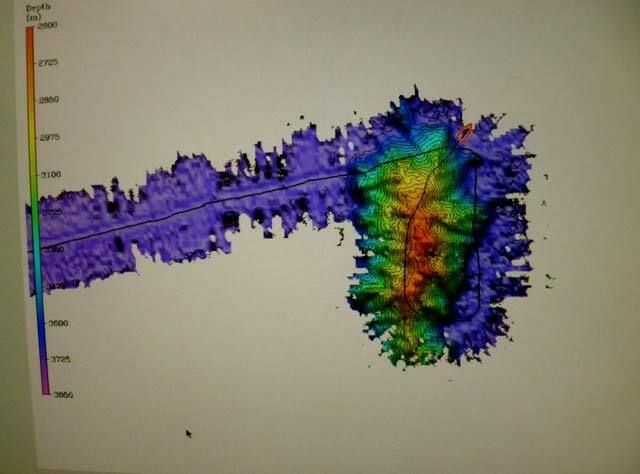 This multibeam image of the new seamount is what I saw in the Science Lab. Today, our planned route took us near an unmapped feature on the sea floor. A 2002 Russian contour map showed a single contour (a bump in the middle of a flat plain) at 3600 meters. This single contour line also appeared on the IBCAO (International Bathymetric Chart of the Arctic Ocean) map. We were so close that we decided to take a slight detour and see if there really was a bump on this flat, featureless stretch of sea floor. The contour was labeled 3600 meters and the sea floor in the area averaged about 3800 meters so a 200 meter bump was what the map suggested. As the Healy traveled over the area we found much more than a bump! The feature slowly unfolded before our eyes on the computer screen. It got taller and taller and excitement grew as people realized this might be over 1000 meters tall. If a feature is 1000 meters or more, it is considered a seamount (underwater mountain) and can be named. Finally, the picture was complete, the data was processed, and a new seamount was discovered. The height is approximately 1,100 meters and the location is 81.31.57N and 134.28.80W. The colors on this 3-D image of the newly discovered seamount indicate depth. Why Isn’t the Arctic Mapped? Some areas of the sea floor have been mapped and charted over and over again with each improvement in our bathymetric technology. Areas with lots of ship traffic such as San Francisco Bay or Chesapeake Bay need to have excellent bathymetric charts, which show depth of the water, and any features on the sea floor that might cause damage to a ship. But in the Arctic Ocean, there isn’t much ship traffic and it is a difficult place to collect bathymetric data because of all the ice. Therefore, in some areas the maps are based on very sparse soundings from lots of different sources. Remember, older maps are often based on data that was collected before multibeam echosounders and GPS navigation – new technology means more precise data! This is the IBCAO. (International Bathymetric chart of the Arctic Ocean) It is a great resource for ships exploring the Arctic Basin. It is still very foggy. We are about 625 miles north of Alaska and plowing through ice that is 1-2 meters thick. This time of year it is the melt season. Increased evaporation means more water in the atmosphere and more fog. Even though we are usually in water that is 90% covered by ice (REMEMBER 9/10 ice cover?) we rarely have to back and ram to get through. 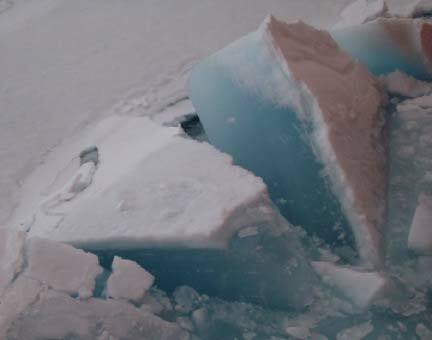 It is noisier lately and the chunks of ice that pop up beside the ship are more interesting to look at. There are blue stripes, brown patches of algae and usually a thin layer of snow on top. I cannot send a current sound file because of our limited bandwidth on the Healy. When we are this far north it is difficult to get Internet access. But, if you would like to hear what it sounds like when the Healy is breaking ice, click on this link from a past trip through Arctic sea ice. 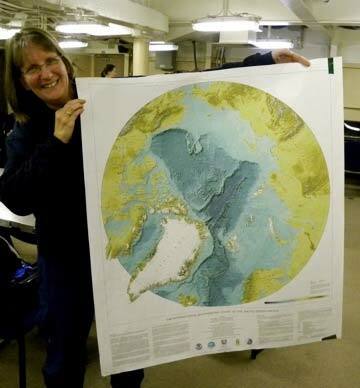 This entry was posted in 2009, Christine Hedge, NOAA Teacher at Sea and tagged arctic, bathymetry, beaufort sea, contour map, CTD sensor, echosounder, navigation, Sea Ice, seafloor mapping, USCGC Healy. Bookmark the permalink.